Processing: Debayer, Multiscale Median Transform, Histogram Transform, Local Histogram Enhancement, ACDNR, and 16-bit TIFF conversion in PixInsight. Saturation, Level/Curves, noise removal (Noel Carboni actions), rotation, and compositing in Photoshop CS6. 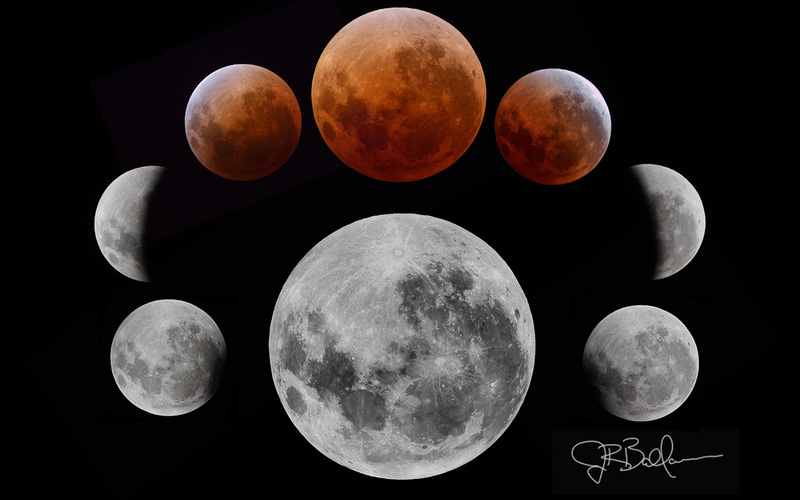 The above presentation is a composite of several of the processed images of the full lunar eclipse taken on April 14 & 15, 2014. Here in Grapevine, Texas, the entire cycle occurred from 23:52 CST to 05:39 CST. This arrangement shows the total eclipse cycle, from its full phase just prior to the eclipse, clockwise to mid-totality at the top, and back again. All images taken during this eclipse are with a Canon T2i DSLR and Tak TOA-150 refractor, except for the full moon shot taken just prior to the start of the eclipse with an SBIG STL-11000m astro camera. This is the second presentation of the data taken during the eclipse showing the major stages of the cycle and the timeline of its happenings.